Easter Egg Hunt for Your Pup! So for most of those who know me, you know that our dog Murray is pretty much our baby. We take him on vacations, shopping, restaurants, and anywhere else they’ll allow our four legged, hairy child! So this year, while Easter is just around the corner – I thought, hey – why can’t we have a Doggie Easter Egg Hunt? Off to Google this I went! And here are the ideas and tips I’ve gathered in case you share in my crazy ideals that our pooch is a member of our family! First… you’ll need large plastic eggs. The larger your pooch, the larger your egg – just in case they try to eat them whole! Then, gather your pup’s favorite treats and snacks. You can also include pieces of hot dogs and cheese. Oh and if you’ve got a ton of those colored hard boiled eggs lying around, those will do too! You’ll want to break up the treats and cheese so they’re easily able to fit into the eggs – figure about 10 to 12 plastic eggs and 2 of the real eggs per participating pooch. If you’re inviting others to participate in the hunt, you can also use coupons or other prizes inside the eggs for larger prizes like stuffed animals, tennis balls, or rope toys that obviously won’t fit inside the eggs. Once your eggs are complete – begin to hide away! Don’t get too creative, but be sure to place them in inconspicuous places. Oh and be sure Fido is not watching! After your eggs are all hidden, let your pooch begin the hunt. 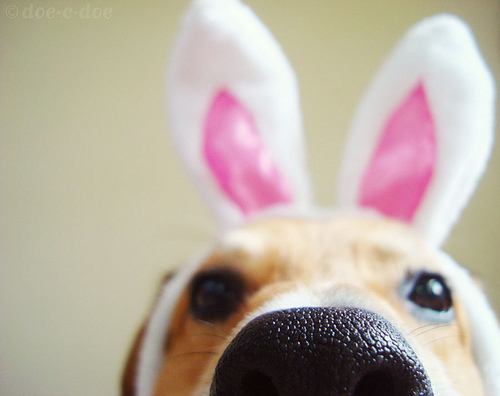 Your pup’s sniffer will locate the eggs containing treats first – so as soon as their nose touches the eggs, be sure to praise! Oh and don’t forget to pick up all the real eggs – otherwise your gardener will be in for a stinky surprise!